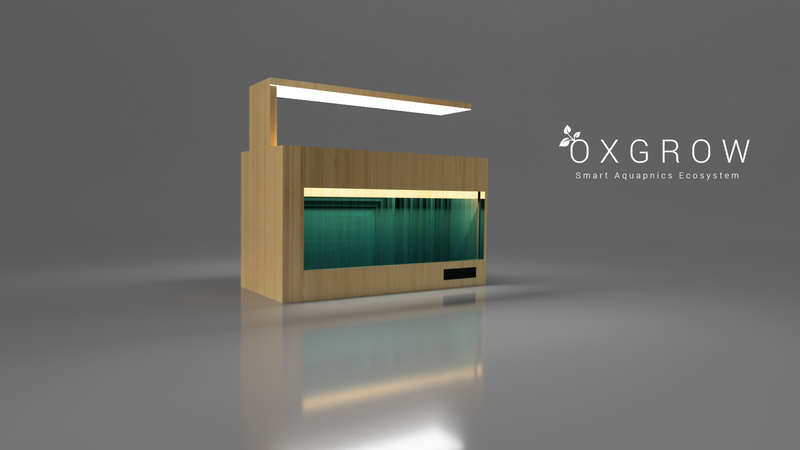 OXGROW is a desktop compatible indoor aquaponics system. The size and shape are more compatible to fit in your desktop or somewhere inside your home or office. With the help of a self sustaining ecosystem, you can grow and eat fresh and healthy vegetables and herbs. Simply, acquaponics is an integrated cultivation of fish and plants. Co-operating a living ecosystem to help each other to grow. In our case, fish and plants will help each other and make an ecosystem to grow themselves by providing resources to grow one another. The Fish will produce the waste and the plants use the waste as the nutrients to grow. Then the Plants will filter the water and remove all wastes from the water, provide clean water for fish. In order to go forward with the project building one is planned. First the basic diagram of the aquaponics is drawn. Then we need to draw a 2D rough sketch of the final results. this would help us with the design process. After all the 3D concept design that will exactly tell how it looks like in real world. We are going to start with the body of OXGROW and face the limitations, we need to cnc mill the design so some curved design can’t be made with cnc and wood texture is almost unavailable. We start the design with the enclosure and pressfit design is chosen here. The design process is done as fast as possible. Now we need to cut out the designed parts for the enclosure. Shopbot is used in this project. A 12mm generic plywood is used to make the enclosure and the support racks. We need to cut out a total of eight pieces, probably it take a half of a 4×8 feet plywood sheet.